Dean from Australia: The Ethical Geek. I make no secret of the fact that I love technology - specifically, consumer technology. I am writing this now on my Samsung Galaxy Tablet which has almost become my primary device for interacting on the interweb and conducting my online life. When I'm not using the Tablet, I am sitting down with my Dell XPS M1530 laptop which is at the core of my career as an author in both the print and digital media. I make calls on my Samsung Omnia i8000 smart phone and listen to my favorite show Keith & The Girl using it in tandem with my Nokia BH-501 bluetooth headset. Just the other day, I bought the new Lego Star Wars 3 game for my Sony Playstation Portable console and my son and I have been having a huge amount of fun romping around in the Star Wars Lego universe. I could go on but, for the sake of your sanity, I'll surmise that you get the idea. I love geeking out on the latest releases in the world of smart phone technology because I don't yet believe that I've seen a device that ticks every single box in terms of THEE feature set that I would love to see (although the Tablet comes really, really close). I love to play around with these new toys when I can afford to buy them or my cell phone provider encourages me to recontract with them - in which case I can usually score a new device for free (as part of said contract). I marvel at the advancements developers have made in their quest for faster, lighter, more powerful and more interactive. But I have given no thought to hands that have wrought these devices into being. The fingers that soldered the wires to the circuit boards or turned the tiny screws or packaged them into the boxes that take them from the factory to the retail outlets that whip their customers into a frenzy with the next anticipated release. I subscribe to a magazine called New Internationalist which hits my letter box once a month. I always enjoy getting my copy. The New Internationalist takes a deeper look into the geopolitical climate globally and examines human rights issues, poverty, ethical industries, non ethical industries and global justice. And when it arrives each month, I love nothing more than to sit down with my copy in the afternoon and get right into reading it with a cup of coffee. Today was one such day. And in my haven of deeper thought and focus upon the global issues that define my generation, I came across an article that stopped me in my tracks. The article was about a corporation in China called Foxconn which is, apparently the largest manufacturer of consumer electronics in the world. Foxconn produces the iPhone, the iPad - both 1 and 2 - and its components can be found in computers and hardware and technology the world over. 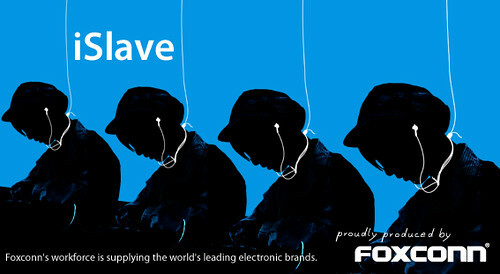 In fact, by the middle of 2011, Foxconn will have captured 50% of the global market in consumer electronics. I've no doubt that much of the compnentry inside my Samsung Tablet that I'm writing this on now came from Foxconn. 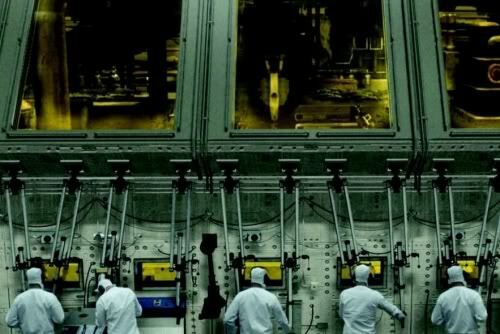 The article in the New Internationalist examined the working conditions inside Foxconn's Shenzhen factory, which is described as a city within a city, occupying some three square kilometers of Chinese real estate. Somewhere in the region of 1 million workers are employed by the corporation. They live and work in the factory and, according to the article, are ruled over by the corporation bosses like a super government that exerts absolute control over their lives. Disturbingly, there has been a spate of suicides at the factory - 18 officially reported deaths in 2010 alone. Workers as young as 17 and no older than 25 have taken their own lives as a result of the draconian conditions they endure inside the factory. Our insatiable appetite for 'the product' has contributed to this disturbing and tragic phenomenon and, having admitted to being a total tech geek, I myself feel part way responsible for it. 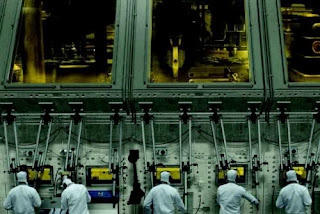 As a writer who has, belatedly, embraced the idea of digital literature as a means of income and a portal for my published work, I am rendered uncomfortable by accounts like Foxconn's and it's workers. But I'm not about to lay down my Galaxy, Omnia 2, Sony PSP or Nokia headset in solidarity with these workers either, because I believe that would be counter productive. The thing is, I appreciate the quality of the product that I hold in my hand and NI's article leads me to think about the hands that constructed this device. Despite China's rapid emergence as 'the' super power of the 21st century, there remains vast poverty and inequality among it's people. 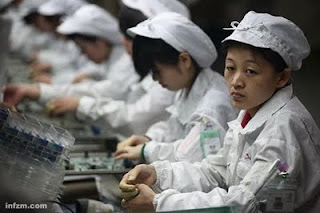 Jobs - occupations - are hungrily sought out by its citizens because the alternative to working would be desperate poverty, which is as bad as the situation that has been described in Foxconn's factory. The solution is therefore simple. 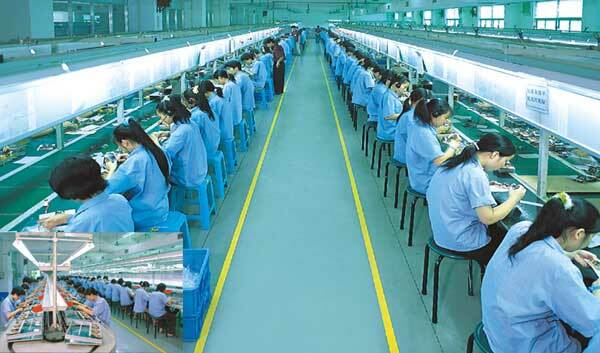 Our insatiable desire for cheaper and cheaper consumer electronics in the longer term is not sustainable, if we are to have any regard for the plight of workers at corporations like Foxconn. In fact, I think there is a moral and ethical imperative on our part to demand that we accept higher prices for these devices and ensure that the beneficiaries of our willingness to pay more are those very factory workers. Corporations like Foxconn should not be allowed to continue operating unchecked. It should be held acconutable for the deaths that have occurred inside its factory. 18 suicides in 1 year cannot ve dismissed out of hand. It chilled me, reading this article today and I had visions of scenes from George Lucas' 1970 film "THX-1138" where an entire society was depicted in very much the same Orwellian way that the NI article reported the conditions inside Foxconn. And that was a work of fiction. There are some encouraging signs of a fledging movement that is agitating for workers rights inside corporations like Foxconn but they are going up against not only a corporate behemoth but a Government whose track record on human rights is arguably, appalling. My conscience will very much form a part of my focus on promoting my written works in digital media. I believe the two can co-exist. I encourage you to think deeper too, about the hands that constructed whatever device you are reading this article on right now. Would you be prepared to pay more? Would you be prepared to help defend the human rights of those hands? Wow. I had no idea this company even existed. How appalling. I want to do some research on this. You hear of this kind of slave-like treatment happening, but usually only in third world countries. What a disturbing story. It is Carolina. I have wondered about this issue before particularly in consideration to my Star Wars toys. I remember dusting my figurines one day and noticing the "Made in China" stamp on one of the legs. I began to wonder at who it was who made this figure, who painted it and packaged it. After doing some reading I discovered that factories like Foxconns are common place, manufacturing all kinds of toys and games and clothing and technology for the Western market. Though I don't think there is any reason to stop collecting or enjoying technology, I do think there is a moral imperative to ensure that whoever it was who made those things earns a decnt wage and is able to have a decent life. That will mean that I will pay more for those things I enjoy but I can live with that. Good lord. I had no idea. I should have guessed this stuff was made in China, but I didn't know. I am posting this story online for others to read. Side note: I have been to China. It is just as scary as you would think. People are so sad there. I felt so blessed to be from the US as I walked around Beijing and watched people who are terrified to challenge their government try to live a joyful life. I have so much freedom. They will have to fight for it (as all of us did) if they want it, and I know they can do it if they just DO IT. And I want to do my part to help, whatever that looks like. I joined Amnesty International this past week (which I kinda hinted at in my post). This is a cause that they have championed in recent times and I feel that it's a good first step for me to take. Mate, powerful post. This is the kind of thing that I send to wife, duck while she spins in all directions, and then sit back and wait for her to change the world. Great story Dean. Thank you. I shall repost wherever I can.